The rail infrastructure firm has recorded 619 balloon-related incidents - many dangerous - across England, Scotland and Wales in the past year. "If you're on a railway station platform with a foil balloon filled with helium on a string and it comes in contact with the overhead wires carrying 25,000 volts, that could cause huge injury or death," said James Dean, chief operating officer for Network Rail's London North Western route. "Ideally, we'd ask people not to bring balloons into our stations at all. Alternatively, carry them in bags so the risk of them floating upwards is minimised." 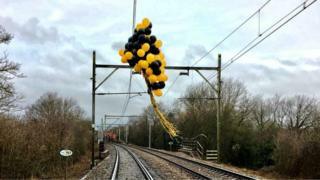 Balloon artists have joined Network Rail's safety campaign. Nabas chief George Oustayiannis said: "Balloons bring fun and colour and a sense of celebration to any event, but please dispose of them responsibly, and never release balloons into the atmosphere. Respect the environment and prevent unnecessary danger and delays - please don't let go."